1. Bottom of kiln, cow head pot and crow. 2. Work is painted with stoneware glazes. 3. Mini puffins and penguins on bottom. 4. Fish are placed on shelves raised on props. 5. Work must not touch each other. Important. 6. More fish on next shelf layer. 7. Small magnets and eggs fill the gaps. 8. Electric kiln is fired to 1260 degrees over night. 9. It takes 24 hours to cool before opening. 10. Work and shelves are removed. 11. Glazes fused on to work in bright colours. 12. Last layer carefully removed. 13. 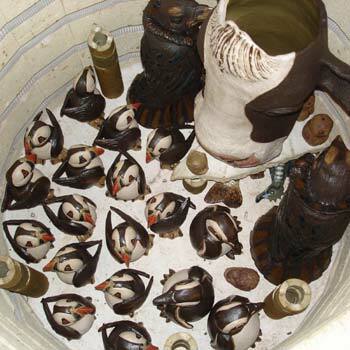 Final layer of work to remove, cow head pot, crows, puffins and penguins.